Moving stinks. This is the sixth time my wife and I have moved in the last 15 years. It never seems to get any easier. In fact, this one has been the biggest challenge, I think, because we now have substantially more “stuff” than we did the previous five times. I suppose that’s because we had two additional bedrooms worth of “stuff” to move this time around. But there still seems to be a lot more than just two more bedrooms. Nonetheless, we are slowly getting the “stuff” we think we’ll need unpacked, put someplace, and then repacking the rest back into storage for the big move up the hill that will occur a couple of years from now. You see, this house is only temporary. That means we have to move again in a couple of years. Yay! Luckily that move won’t require us to load and unload multiple 26′ moving trucks or drive hundreds of miles. 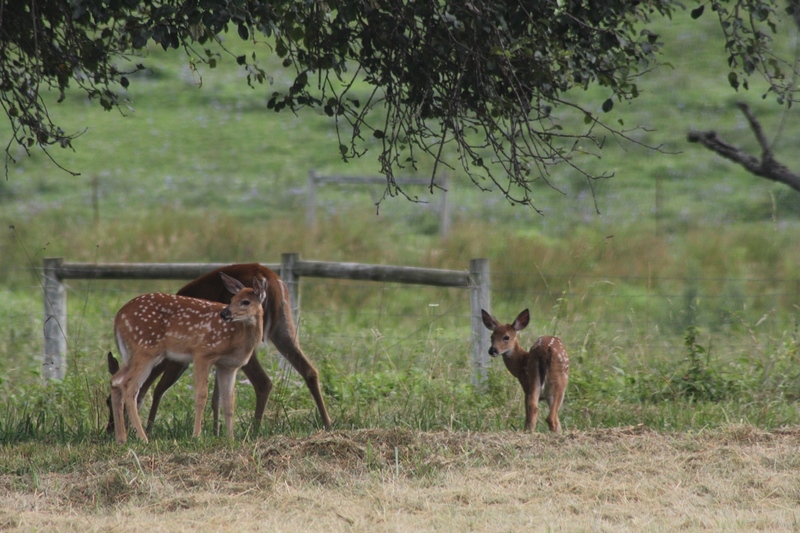 Instead it will be just a few hundred yards up the hill to the other side of the property. So for the last few weeks, we’ve been tackling the cleaning, unpacking and general property maintenance that comes with moving into a less than well cared for, 1950’s era, rural farm house (plus there’s still that day job thing to deal with). We’re also in the process of disassembling an old, dilapidated shed that our homeowner’s insurance company says needs to be taken down if we want to keep our coverage. Not many jobs are quite as “fun” as taking down an old farm outbuilding, board by board (we’re salvaging the lumber for a future project), in the middle of July. Did I mention how “fond” I am of wasps? Needless to say, the shop has been vacant, except for the numerous flying woodworkers that call the building home. I had the fortunate opportunity to teach a saw sharpening class in the new space shortly after moving in (thanks John! ), but other than that, the tools have just sat there in a state of chaos. Over the next few weeks, however, I hope to change that. I should finally get some time to begin unpacking the shop, after I take care of a few exterior issues. 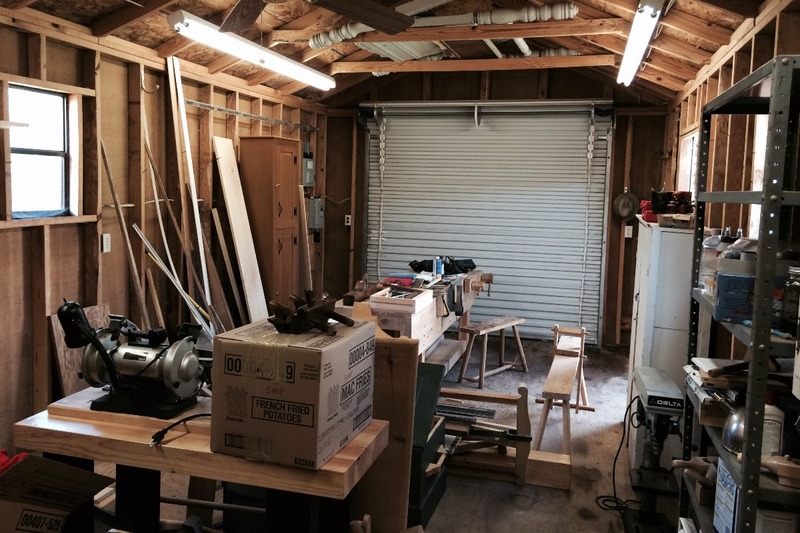 The “new” workshop. After I hack down the 6′ tall weeds and waist high mint plants, secure a few loose wall panels, and evict the thousands of wasps and hornets living under the eaves, it should be a decent place to work…for now. The building isn’t too bad, at least structurally. The roof, while a bit weathered, keeps it dry on the inside, so that’s a good start. It’s quite overgrown around the perimeter, which I plan to take care of this weekend (anyone want a cartload of fresh mint?). A few of the wall panels are loose, but that won’t require more than a few nails to remedy once the vegetation has been eliminated. The more pressing issue will be the eviction of the current tenants. If there is a Daytona Beach for wasps and hornets, the eaves of this building must be it. They are literally packed with comb from rafter to rafter. I’ve already gone through several cans of pesticide, but there are many more nests to bulldoze up there, plus a few more on the inside of the building. These are, of course, in addition to those within the building we’ve been disassembling (you can see part of that building just behind the shop in the photo above). Other than the unwanted guests of the flying variety, the shop is in OK shape. It’s roughly 12′ wide by 28′ long. So it’s about the size of an extra deep garage. It may not seem like that much room to some folks, but it’s almost 4 times more square footage than I gave up, so I’m thrilled with the amount of space. It’s not insulated, so it gets hot during the heat of the day, but the heat of the day doesn’t often get above 85 degrees up here in the mountains, so it’s been quite tolerable. Winter might be another story, but we’ll burn that bridge when we get there. It has two small windows, though they’re not really large enough to provide much natural light. Luckily, it was a woodworking shop before we bought the place, so it’s already been wired, and there is plenty of additional artificial lighting. The overhead door is nice for ventilation and providing more natural light, but then there are all those wasps and hornets to deal with, so I’m not sure how often I’ll open it until I can eradicate them. The inside walls are open studs, which will make hanging things on the walls much easier than they were in my old shop, with drywall covered walls. The floor is plywood, which will be much nicer to stand on all day than my old concrete slab. The inside of the shop is in fine, usable condition. The rafters are open, providing for a nice, built-in lumber rack. The walls are open stud framing, which will simplify the task of finding a stud when hanging things on the walls. There’s more ceiling height than there was in my old shop, which will be nice for handling long boards. Overall, there will be plenty of space for all of my tools and benches, and lots of additional room to add a few more items. So I’m very happy with this space for a temporary shop. 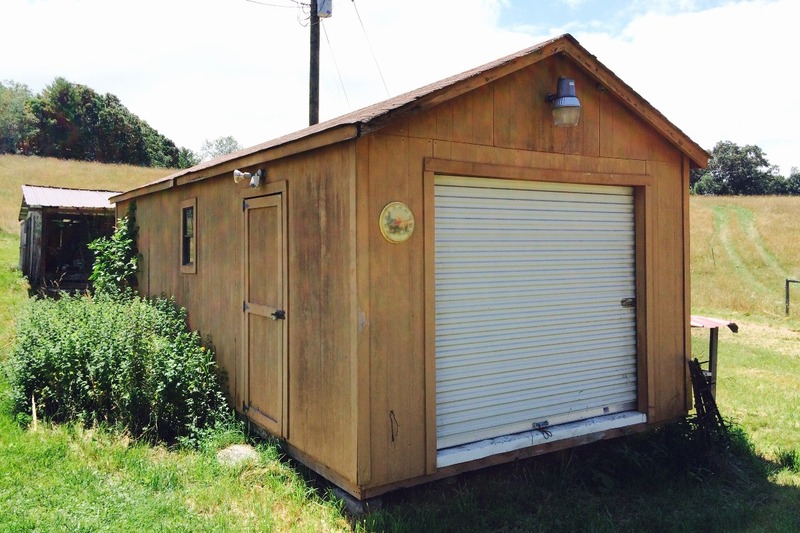 It’s not my dream shop, but it will do for a couple of years until I can begin construction of the dream shop…right next to the dream cabin in the mountains. Until then, I’ll enjoy the space that I have, and the daily visits from my new neighbors. 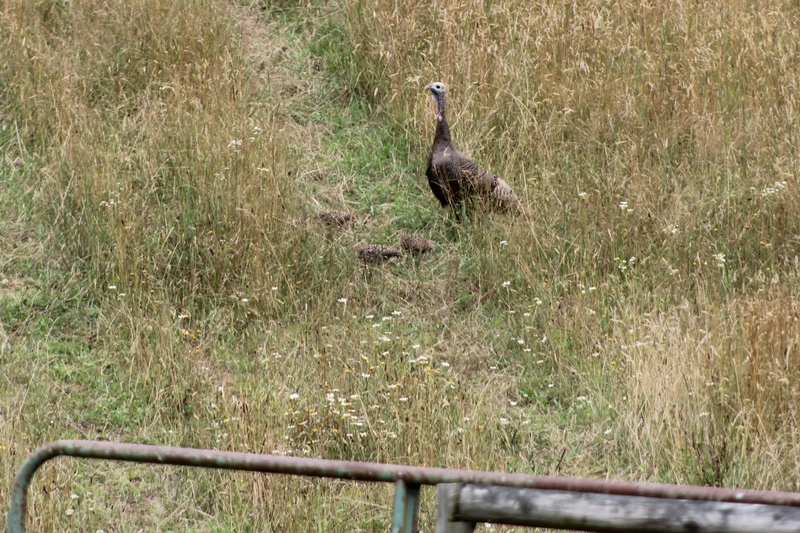 Momma turkey and her brood. 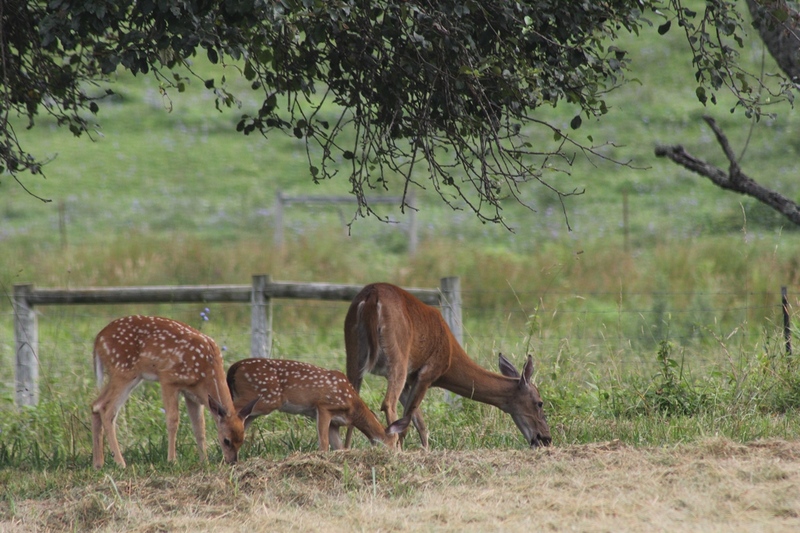 They love to clean the apples off of the ground in our orchard.